March, 2015 | H&R Group K.K. Rugby sevens is a variation of the standard rugby union in which teams are made up of seven players, instead of the usual 15, competing in shorter matches generally during summer months. Sevens is popular with professional and amateur players throughout the world. Besides the many multi-sport events where games are held, such as the Olympics, international competitions such as HSBC Sevens World Series and the Rugby World Cup Sevens keep the energy going in this fast paced sport. If you are interested in seeing a game, the HSBC Sevens World Series travels to nine cities in five continents, including Tokyo, where teams compete to be the Sevens World Champion. The 2015 Tokyo round will be held from April 4 to 5 at the Prince Chichibu Memorial Rugby Stadium as Round 7 of the HSBC Sevens World Series. With growing interest and great anticipation of Sevens Rugby that has been chosen as the new official Olympic sport at 2016 Rio de Janeiro, this year’s Tokyo Sevens is promised to be full of excitement and enthusiasm. The arrival of spring means only one thing in Japan: hanami. Hanami is a great time when people get together in parks all over the country to see the beautiful cherry blossoms. They gather with family, friends and coworkers to eat, drink and be merry. 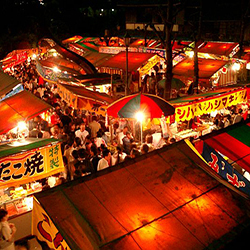 As with most Japanese matsuri (festivals), the ‘eat’ aspect is particularly important, and you will find Yatai (mobile food stalls) in hanami viewing spots selling all sorts of interesting and wonderful foods. While some of the food is instantly recognizable, others need a little explanation. Yakitori – You will find at most Japanese festivals many foods will be meat fried on sticks. You can find steak, sausages and even octopus skewered and fried on hotplates. While all of these may be found under the name of yakitori, perhaps the most popular is the true yakitori, grilled or fried chicken. You can choose between having it cooked with salt or tare sauce, a mix of sake, soy sauce, mirin and sugar. Karaage – The Colonel has nothing on this deep fried chicken! Chunks of chicken are marinated in a mix of soy sauce, garlic and/or ginger, and then coated in seasoned flower and deep fried. It comes served in a large paper cup with a long wooden skewer with which to eat it. Takoyaki – Originally an Osakan street food, takoyaki has found popularity all over the country, particularly at matsuri time. These are batter balls with a large helping of diced octopus (tako), pickled ginger and green onion. There are various toppings to takoyaki, the most common being takoyaki sauce (similar to Worcestershire sauce) and sprinkled with dried seaweed and dried bonito flakes (katsuobushi). Other toppings include mayonnaise and even cheese. Be warned though, many non-Japanese find katsuobushi an overpowering taste. If you fall in to this category you can say ‘katsuobushi nashi de onegaishimasu’, no katsuobushi please. Okonomiyaki – There are various types of okonomiyaki, but at most festivals you will find the Osaka variety. Sometimes called Japanese pizza, okonomiyaki is closer to an omelet and was originally made from leftovers, and thus the ingredients can vary (the name comes from okonomi, meaning ‘what you like’ and yaki meaning ‘cooked’). The base ingredient is a kind of pancake batter cooked on a hotplate. On top of this comes shredded cabbage, green onion and meat: usually either octopus, thin pork belly or shrimp. Sometimes it will also have mochi or cheese. It also often comes topped with katsuobushi, sometimes with an egg. Yakisoba –According to a survey conducted by website Gadget Tsushin, yakisoba is Japan’s number one matsuri food. It is similar to chow mein, from which it derived. Despite the name it is not actually soba (buckwheat) noodles, but wheat flour ramen-style noodles. Thin slices of pork are fried with the noodles on a hotplate along with diced cabbage and a sauce similar to oyster sauce. Once again katsuobushi sprinkles top this dish. Ikayaki –Ikayaki is perhaps the most daunting of the meats on a stick, being as it is a whole squid (ika), grilled. Other than it being coated in soy sauce, there isn’t much more you can say. Jaga bata – you are on firmer ground with jaga bata, literally buttered potatoes. Large potatoes are baked in huge steaming wooden ovens, usually minus the skin. Once served you are given a trowel and pointed to a vat of butter. You can add as much as you and your arteries can stand. Choco banana – Choco banana probably needs no explanation, but it is extremely popular. Sometimes you may find other chocolate covered fruit, including pineapple. Taiyaki – Made using regular pancake or waffle batter, taiyaki is poured into a fish shaped mold, filled and cooked on both sides. The most popular filling is sweetened red bean paste, but you can also find custard, chocolate or sweet potato. Dango – Dango is a sweet dumpling ball made from rice flour (mochiko) similar in texture to mochi, and served on sticks. There are various flavours, but the most popular is probably the tricolor hanami dango, one ball coloured by read beans, one by eggs, and one by green tea. At this time of year my might find one is flavoured by sakura. Ramune – For the adults you can get the usual array cans of beer, shochu and jars of sake, but for kids at festival time, ramune is a must. This sparkling soda drink had been a popular matsuri staple for many years and is opened by popping a marble down into the bottle’s neck. Originally ramune was lemon-lime flavor but there are now at least 36 flavours, including takoyaki!